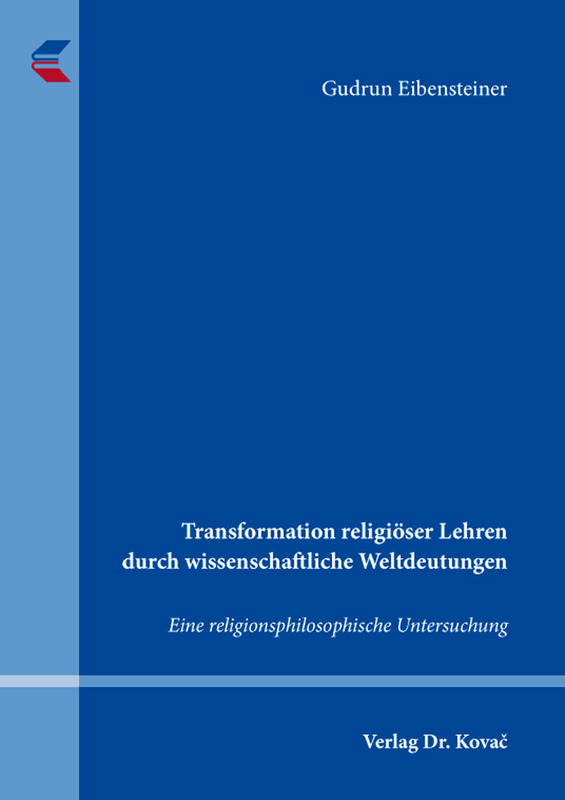 Transformation religiöser Lehren durch wissenschaftliche Weltdeutungen. Dissertation (english) von Gudrun Eibensteiner, Verlag Dr. Kovač 2019, 228 S.
Christian values, norms and images have shaped Western culture for a big part. Over a period of more than 1500 years, the church has not only determined people’s lives, but has also influenced legislation. But how are these religious images and teachings compatible with today’s knowledge and a variety of world interpretations? The author explores the question of what it means for the believers of a religion, if the worldview changes and the knowledge stocks expand and if certain religious teachings in a scientific world view can be developed so that they still have a meaning for the lives of the believers. It explains how religious images and doctrines emerge, which elements of culture they store, and how today’s theologians attempt to interpret the great themes of world creation, the sin and guilt of man, the redemption from the power of evil, the imagination of the continuation of the soul after the death of the body and of a divine judgment. In contrast, the emergence and development of religionless and atheistic interpretations of the world is treated. Also portrayed is the naturalistic interpretation of the world, which renounces all religious assumptions and thus leaves no room for religion and metaphysics. However, the findings of quantum physics with its meaningless information allow the author to touch religious interpretations of the world. Many of the Christian values of morality, such as solidarity, some of which come from Greek philosophy, retain their meaning in secular societies. It turns out that in modern society, the traditional religion is increasingly turning into a cultural religion. Culture Christians uphold the moral values and cultural achievements of the Christian religion, but they only partially follow the religious teachings and are therefore more able to consensus and thus can significantly contribute to the maintenance of the dialogue between religious and non-religious people. Processes of transformation are described as cultural learning processes, because science does not destroy the possibility of religious interpretations of the world.